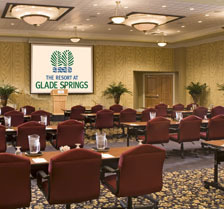 The Resort at Glade Springs, a premier conference center resort in West Virginia features an ultimate meeting discounted package including credits toward a future meeting. (1888PressRelease) February 19, 2009 - The incredible mountains of West Virginia and The Resort at Glade Springs conference center resort make an ideal location to host exceptional resort meetings with great value this season. The Resort at Glade Springs has created the ultimate hotel Meeting Perks Package designed to make it affordable for companies and groups to get together at a full service resort with a myriad of amenities and not break the bank. Companies booking a hotel Meetings package will receive over twenty complimentary, discounted or value-added amenities with this special offer. 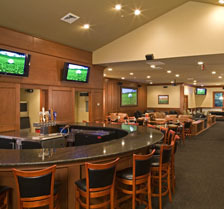 These special West Virginia resort meeting package offers include a $50 Glade Springs spending credit per revenue producing accommodation, $10 per room night credit against catered food and beverage programs, a one hour opening cocktail reception, 10% off audio visual equipment rental and 3% off the total master bill offered as a credit toward a future meeting. In addition the conference center resort in West Virginia is offering 1 complimentary room and 1 VIP upgrade for every 25 rooms booked, a 20% attrition allowance, a complimentary logo amenity for two designated guests and a complimentary lobby office for the meeting planner. The conference package includes daily resort service fees as well as West Virginia state lodging and occupancy tax. Also included in the hotel meeting package is complimentary use of the resort’s fitness center located in the Leisure Center, shuttle service throughout the resort, daily newspaper, in-room coffee, pool privileges, on-site parking, wireless internet and housekeeping and shuttle driver gratuities. 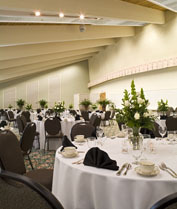 The West Virginia conference center resort offers a wide variety of beautiful accommodations, perfectly designed to compliment a wide variety of groups and parties. 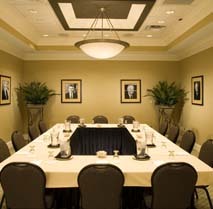 The Meetings Perk Package is available for bookings through May 15, 2009. 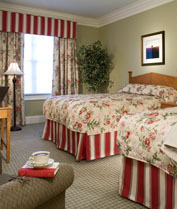 For more information or reservations visit www.gladesprings.com or call 1-866-268-8058. The Resort at Glade Springs is West Virginia’s finest all-season resort. Located in the heart of West Virginia’s beautiful mountains near the always exciting New River, bountiful opportunities for adventure, sport and relaxation await visitors. Enjoy championship golfing on the Cobb, Stonehaven or Woodhaven Course (summer 09), luxury spa services, and blissfully simple pursuits such as swimming, biking, hiking, boating in a breathtaking landscape. Winterplace Ski Resort is 8 miles from Glade Springs and offers 27 trails for skiers and boarders and West Virginia’s largest tubing park. Bowl a game or two, catch a movie, ride horseback on natural trails, or enjoy a priceless West Virginia sunset – without ever leaving the resort.